A funicular, also known as a funicular railway, incline, inclined railway, inclined plane, or cliff railway, is a cable railway in which a cable attached to a pair of tram-like vehicles on rails moves them up and down a steep slope; the ascending and descending vehicles counterbalance each other. The word is from the Latin funiculus, a diminutive of funis, “rope”. 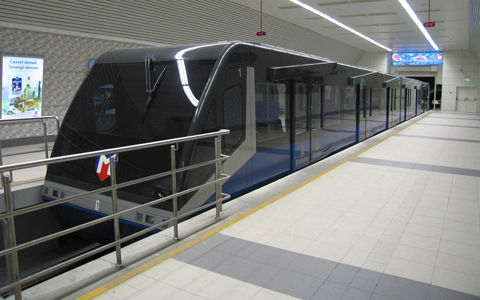 The basic principle of funicular operation is that two cars are permanently attached to each other by a cable, which runs through a pulley at the top of the incline. Counterbalancing of the two cars, with one ascending and one descending the slope minimizes the new energy input needed to lift the ascending car. Winching is normally done by an electric drive working on the pulley. Sheave wheels guide the cable to and from the drive mechanism and the incline cars. A few funiculars have been built using water tanks under the floor of each car which are filled or emptied until just sufficient imbalance is achieved to allow movement. The movement is then controlled by a brakesman. 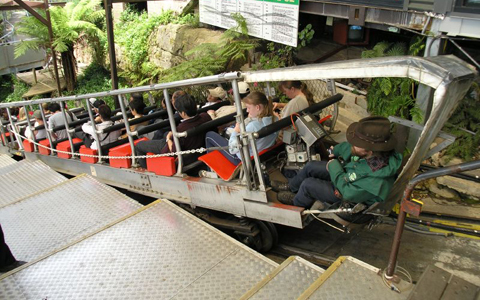 The cars are attached to a second cable running through a pulley at the bottom of the incline in case the gravity force acting on the vehicles is too low to operate them on the slope. One of the pulleys must be designed as tensioning wheel to avoid slack in the ropes. In this case the winching can be done also at the lower end of the incline. 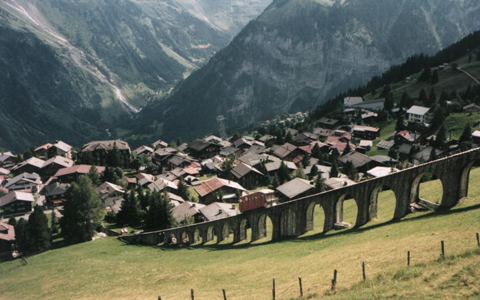 This practice is used for funiculars with gradients below 6%, funiculars using sledges instead of cars or any other case where it is not ensured that the descending car is always able to pull out the cable from the pulley in the station on the top of the incline. Passing track with Abt switch on the Flying Dutchman Funicular at Cape Point, South AfricaEarly funiculars use two parallel straight tracks, with separate station platforms for each vehicle. Between the tracks is sufficient space for the two cars to pass at the mid-point. The wheels of the cars are usually single-flanged, as on standard railway vehicles. Examples of these types of track layout are the Duquesne Incline in Pittsburgh, Pennsylvania, and most cliff railways in the UK. Later new layouts using less space have been developed. These layouts usually have only two or three rails for the most part of the slope,with four rails only at the dead center or passing section of the funicular. Cars used with a two-rail configuration have flanges on both sides of the outboard wheels, which keeps them aligned with the outer rail, thus holding each car in position. The inboard wheels are unflanged and ride on top of the opposite rail, thereby easily crossing over the rails at the passing track, and avoiding the need for switches and crossings, since the cars have the flanged wheels on opposite sides and will therefore automatically select different tracks. In layouts using three rails, the middle rail is shared by both cars. The three rail layout is wider than the two rail layout but the passing section is simpler to build. Furthermore in a three rail layout the rack used for braking the cars can be mounted higher making it less sensitive for choking in snow fall conditions. Some four-rail funiculars have the upper and lower sections interlaced and a single platform at each station. The Hill Train at Legoland, Windsor is an example of this configuration. The track layout can also be changed during the renovation of a funicular, and often four rail layouts have been rebuilt as two or three rail layouts; e.g. the Wellington Cable Car in New Zealand was rebuilt as two rails.